Pour water into a pot big enough to cook 4 eggs and place over high heat. Once it boils, carefully add the 4 eggs, cover, reduce heat to medium-low and boil for 15 minutes. While the eggs boil, mix the mayonnaise, jalapeño, and vinegar. The mayonnaise will have a consistency between runny and thick, and you will see pieces of jalapeño. Peel the avocado, remove the pit, and mash it with a fork until smooth. Toast the bread to your liking in a toaster, hotplate or oven. When the eggs are ready, drain the pot and refill with cold water to keep the eggs from cooking further. Peel and slice them, one by one. 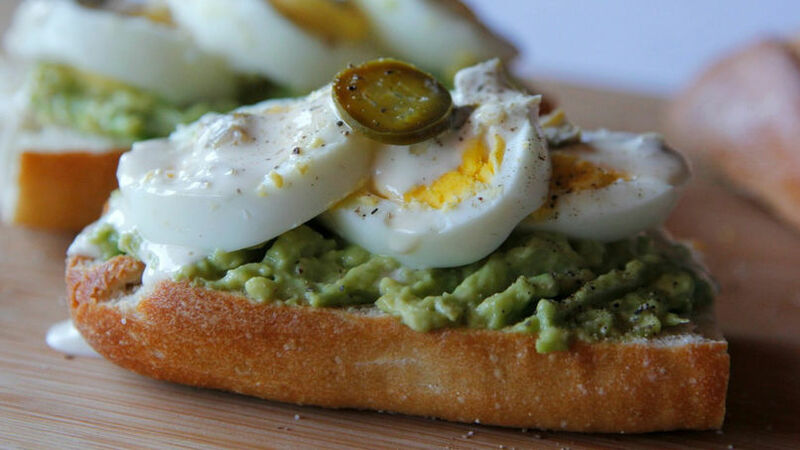 Take a piece of toast, spread with a layer of avocado and sliced egg, and top it off with the jalapeño mayonnaise. Add salt and pepper to taste. Repeat until you’ve finished all 4 slices of bread. If you want smoother mayonnaise, blend the three ingredients instead of mixing. To save time, cook the eggs a day in advance and place them in the refrigerator without peeling. Before serving, heat them up for a few seconds in the microwave, then serve. This recipe is so delicious, you’ll be amazed by how easy it is. It’s a great way to start the day, but it’s also a great option for lunch or a snack. You can use slices of bread, although I prefer to use a baguette. I just slice and toast it so that it’s hot and crunchy. Jalapeño mayonnaise livens up the recipe phenomenally. Try it out.